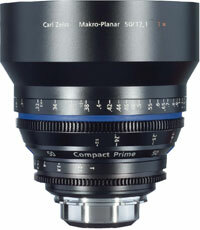 Optimized for close-focus applications the Compact Prime T2,1/50 offers new creative ways of capturing macro scenes. The cine style lens housing of the Compact Prime T2,1/50 Macro ensures robust construction and well thought out ergonomics custom designed for the rigors of life on the set. The modern lens design as well as tight manufacturing tolerances ensures low distortion, high resolution and excellent color rendition for sharp images. The floating elements design ensures a virtually unchanged performance from 0.24 m (0.79 ft) to infinity. As all Compact Prime lenses the Compact Prime T2,1/50 Macro covers up to full format still image size (24 x 36mm) and is color matched with the other lenses of the Compact Prime family.